As the title credits start rolling, songs play in the background—a medley of melodious old tracks. 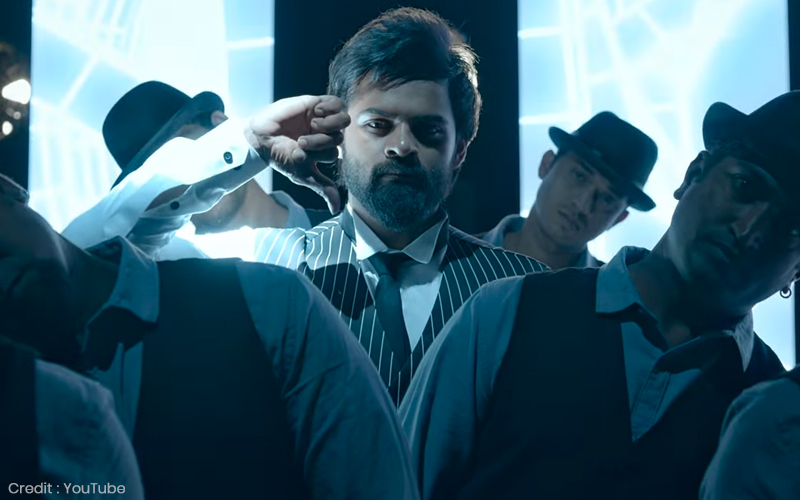 A voiceover tells us that it is supposed to remind us of DD’s Chitralahari. It didn’t, but sure. Then the voice continues to tell us why they borrowed their film name from this program. Apparently, like the program, the film is going to bring different people together. Okay. Just like any other film or story then. Again, it didn’t hit the spot, but I understand the intention. That’s the whole film for you. It tries to tell something insightful about life and the uphill battle it can be. But it gets all muddled up in the process, and by the time the moment arrives, the light shines rather awkwardly on the epiphany to be. Vijay, a guy who’s never seen success—ah, irony, is trying to find money for his project—Auto Alert Accident Device is the name. He falls in love with Lahari, a woman who is convinced that she isn’t smart, thanks to her bad parents and friends, and, like a good Telugu heroine, she reciprocates. Things start to go wrong after this with unnecessary lies and misunderstandings taking over. Added to this is Swecha, a child of divorce, who distrusts men. Kishore, the film’s writer-director, has a knack for storytelling that feels anew, even if the underlying story is as old as time. He does it well with Nenu Sailaja, not so much with Vunnadhi Okate Zindagi. Here, he is somewhere in the middle. He tries to make his story engaging and relatable by writing interesting characters like Vijay’s father—a man who understands when to encourage and when to be tough with his child, and Vijay—an impatient “youngster” who thinks that bad things only happen to him and him only, for that matter. And as individual characters—a docile woman, a seemingly unbreakable female executive, a singer-songwriter looking for a break in a K. A. Paul kind of setup—they all have something to say. But when they come together as a story, they really don’t really make as much sense as one would hope for. The bizarre, almost counterproductive, screenplay—the court scenes are a mess—and the unremarkable soundtrack don’t help matters either. Sai Tej [there is no Dharam anymore, not in the society and not in his name] tries to give us an underplayed version of a man who is easily frustrated. His woes aren’t any different from that of the next person, but he insists that they are. Having never seen him play a sombre guy, it comes as a surprise that his body language is perfect for a role as such. Nivetha Pethuraj, as this glassy woman, does her role justice even if the role needed more depth than being a manhater. Kalyani Priyadarshan, on the other hand, fails to make an impression, except for that one scene close to the end where she tells a kid to do as she pleases—the kid definitely doesn’t understand her pain and tears, which made the scene even more remarkable. Both Sunil—his stint with a cycle as a solution for drink and drive fines, and his hair-love analogy got proper laughs—and Kishore—he plays a bad Tamizh stereotype who throws “da”s every which way—have nothing much to do except for a few moments. Vijay decides to confess his love for Lahari in a movie theatre while watching a horror film. Even though it is funny to watch two cowards have a conversation through the length of Conjuring, it doesn’t take away from the fact that he stalked her to her classes. I mean, I’d like to believe that men are better than that, but films aren’t allowing me to do so. Neither are they giving me anything remotely romantic to root for the main couple. If a film is doing a commendable job, the audience should feel everything the characters are feeling. How am I supposed to cry/laugh with the characters, if I don’t believe that they are actually going through them? Sakeertana is an engineer who took a few years to realise that bringing together two lovely things, movies and writing, is as great as it sounds. Mainly writes about Telugu cinema because no one else would. Now Streaming: What If Game Of Thrones Was Made With Bollywood Actors?